Mr Daisy developed food allergies at age of 2 relieved by switching to grain free food. Just before his 5th birthday was diagnosed with diabetes with blood sugars in the 450s. Changed from grain free dry food to grain free wet weight management food (weight ranged 18-22lbs-he is a large framed cat). Could not use prescription foods due to grain content, not to mention the price. Even with the wet food, he required 3 units of vetsulin 2 times/day to keep sugars 100-130mg/dL 6 hours after vetsulin dose. Weight stabilized at 17lbs which is optimal for him. He is now 6.5 years old. I must order his food online as we live in the middle of nowhere. My order was delayed a few weeks ago so had to purchase food at grocery store. After reading all labels, found a cooler with Freshpet. Due to food change, monitored blood sugar closely. By 2nd day, blood sugar was 70 six hours after insulin dose. Kept decreasing insulin and after 4 days no longer needed insulin. Random sugars range 80-120mg/dL. He is so happy. More frisky and playful! 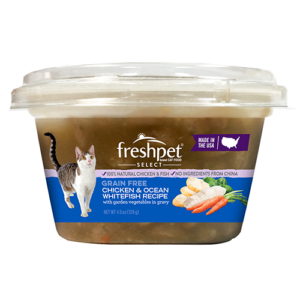 As a Registered Dietitian and Certified Diabetes Educator (for humans), I spent a lot of time researching the best food for Mr Daisy when diagnosed with diabetes, but had not seen a recommendation for Freshpet food. My first vet pushed the prescription food at $2/can, my cat needs 2.5 cans/day or $35/week! Have a new vet… The wet food I was using cost about $15/week. He needs 1.5 cups of Freshpet per day, so about 3 pouches/week or $13/week-healthier option AND saving $! Plus saving on syringes and insulin. Will continue to check sugars at least a few times/week for a while. Thank you Freshpet for making it possible to improve the health and quality of life for Mr Daisy. He is loved by his parents, 3 kids, and a dog. We look forward to spending many more years with our amazing kitty.